Nutrition information per serving (1/18 of recipe). This recipe is an excellent source of protein and selenium; and a good source of niacin, vitamin B6 and zinc. 1. Combine barbecue sauce and chipotle peppers; reserve 3/4 cup sauce mixture. Brush some of remaining sauce mixture onto all sides of roast. 2. Place roast on grid over medium, ash-covered coals or over medium heat on preheated gas grill. Grill; covered 25 to 35 minutes for medium rare (135 degrees F) to medium (150 degrees F) doneness, basting roast with remaining sauce while grilling and turning occasionally. 3. To prepare Slaw, combine coleslaw mix, bell pepper, green onions, dressing and cilantro in medium bowl; toss to combine. Season with salt and pepper to taste. Refrigerate until ready to serve. 5. Carve roast across the grain into thin slices. Toss with reserved 3/4 cup sauce mixture. 6. 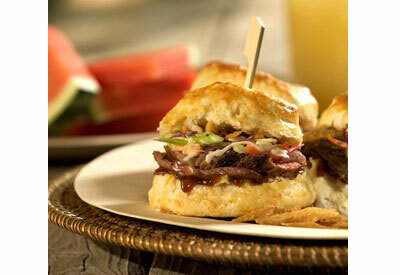 Evenly divide beef slices, coleslaw and tortillas among biscuits. Close sandwiches. To prepare roast in the oven, preheat oven to 425 degrees F. Brush sauce mixture onto all sides of roast. Place on rack in shallow roasting pan. Do not add water or cover. Roast in 425 degrees F oven 30 to 40 minutes for medium rare; 40 to 45 minutes for medium doneness. Baste roast with remaining sauce 10 minutes before finished roasting. Remove roast from oven and let stand as directed in step 4.